2006 Dale Earnhardt Jr framed and matted 8x10 Richmond Win photograph, with autograph and an actual piece of race-used sheet metal from the #8 Budweiser Chevrolet. This item also has an engraved plate highlighting his career stats to date and information about the piece. The photograph and sheet metal are officially licensed by Dale Earnhardt Incorporated and NASCAR. Each photograph is also hand numbered. 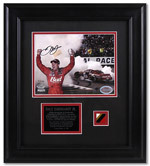 This piece of history is a must have for Dale Earnhardt Jr fans. Actual size is 15.25" x 17.25"
Autographed - The picture was autographed by Dale Earnhardt Jr. Includes Mounted Memories authenticity statement. Officially licensed and individually numbered. Clock measures 11" x 23" and features a Jebcote high gloss finish. Officially licensed and individually numbered. Clock measures 23" x 11" and features a Jebcote high gloss finish.